Unlike other apartments that are ready-for-occupancy, a ready-made home offerss great advantage because it can be modified or customized to your own style. If you look closer, you’ll see the benefits of having a carefully-crafted and individually-constructed house, like having more creative spaces, for example. Of course, your creativity can be explored further in designing your house; however, if you lack inspiration, check out and see a variety of unique structures and interesting layouts from our featured house. Today, the house will be discussed in a three-dimensional structure, for everyone who needs it. 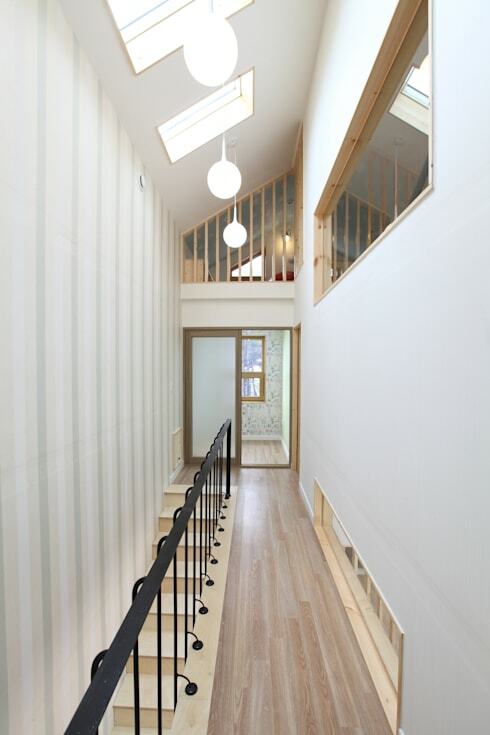 The house was built by Toto in Namwon, Jeonbuk, which has a simple structure like “a carton of milk” from the outside, but the interior filled with unexpected and surprising arrangements. 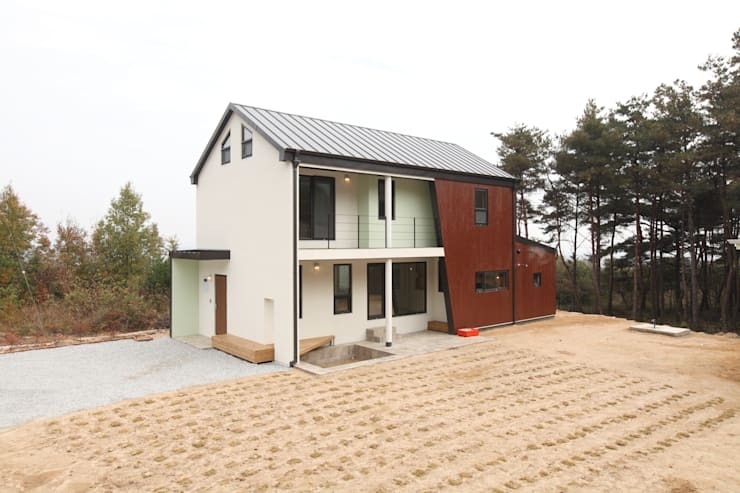 At first look, this house will call your attention with its distinctive form, like a milk carton, with a roof structure that adopts the simplest form a square shape. This simply looks like a life-size, full milk carton. But of course, when you look closely, it’s still a house. With the front area facing south open, the wood paneling covers the south side and part of the side, making an impression of layers of curtains in his home. In addition, there is also a mini pool on the first floor, and a balcony with a beautiful view on the second floor which provides space for a good family bonding time. First., he sees the house and says looks “simple”, but then he stares a little longer, and the vertical and horizontal elements intertwine with each other and thus create a three-dimensional view that gives a wonderful impression. If you pass through the patio, a three-dimensional feeling arises as you walk towards the curve at the end; the living room boasts and entices with its three-dimensional elements as viewed in different angles. The room was made simple with a wide, flat area on the floor and the height of the carpets distinguished. The living room, where every member of the family can comfortably spend time in, is also the perfect spot to welcome guests. Let's take a look inside the house. Coming in from the entrance, right next to the indentation on the outside, you'll find a wide driveway. The terrace also boasts of porcelain material, the outside forming a shadow of the curve. This area also has a distinctive effect on the inside of the house from its terrace. The rooms were spacious for children as seen from the living room, from the sitting area. The rooms were spacious enough for the children to place their bikes there. 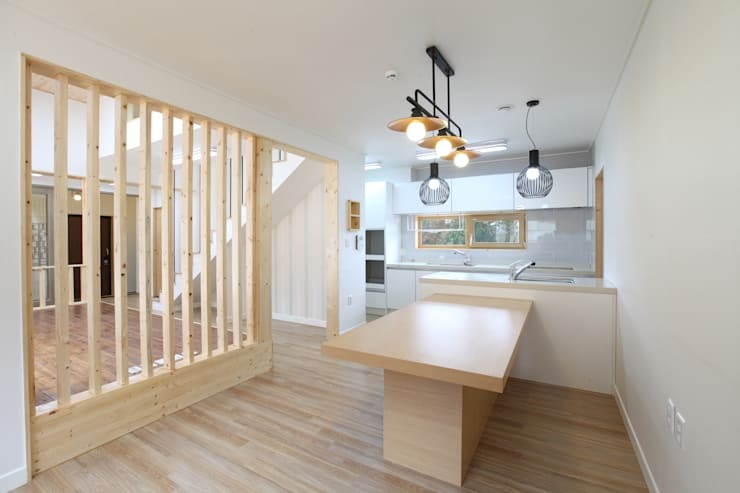 The kitchen inside the house can be seen from the living room, from the sitting area.Bright colors and light on wooden pillars separates the living room from the kitchen and dining area. Because it is not limited by the barrier wall, the public space flowed freely and seemed spacious. The deepest part of the house was the tidy kitchen built in a combination of white color, with shades of Irish surfaces on the front and a dining area in front of it. The setting of this room feels like a family kitchen reminiscent of a peaceful family life. Once you have set a public space for family friends and relatives, let's look at the private area reserved for the members of the family. Personal family room continues to the second floor. Stairs up to the second floor is built beautifully it becomes its own scenery. As children went up the steps leading to the northern part of the house, they are getting their dose of enough sunlight. 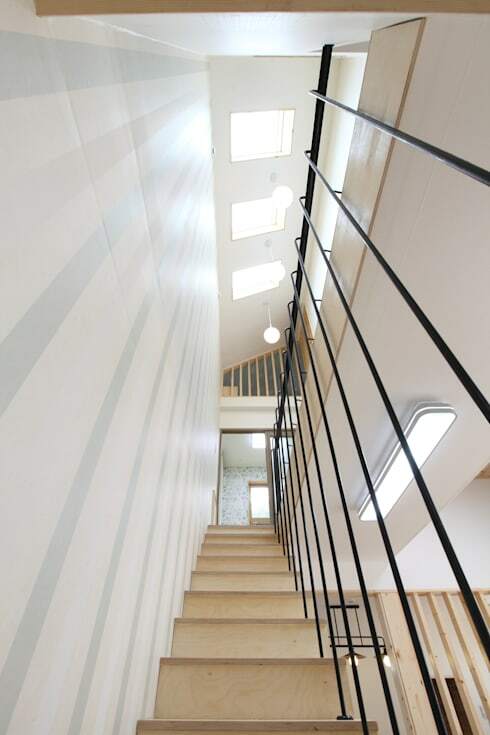 The stairs at house, leading to a window in the ceiling ensures that rays of sunshine enter the house, as he sit comfortably relaxed at any time. 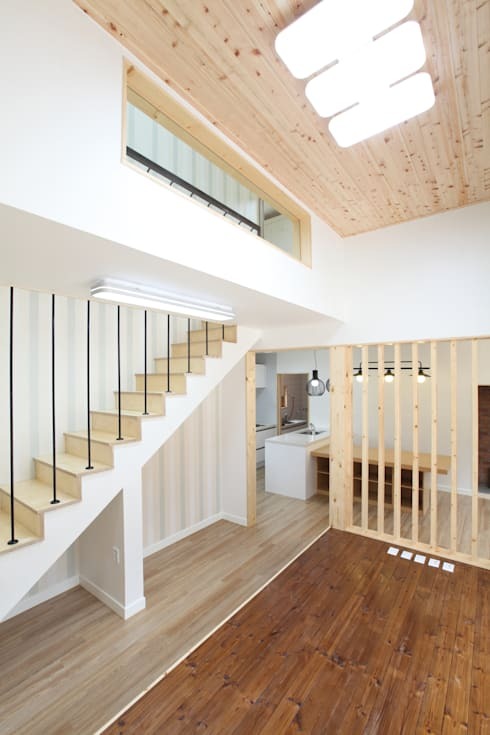 Since the ceiling for the general area on the first floor was built high, and the children's stairs seemed to be steep steps, the three-dimensional structure becomes clearer in the big picture. When you go up the stairs and went straight to the first floor, you will find a corridor overflowing with interesting elements that can be seen around the room. Look around the corridors of the second floor and see that the pleasure is hidden, adding a curious flavor to it. You can see their guest room on the first floor with a window looking into the rear area, and there is also a window with a study room on it. 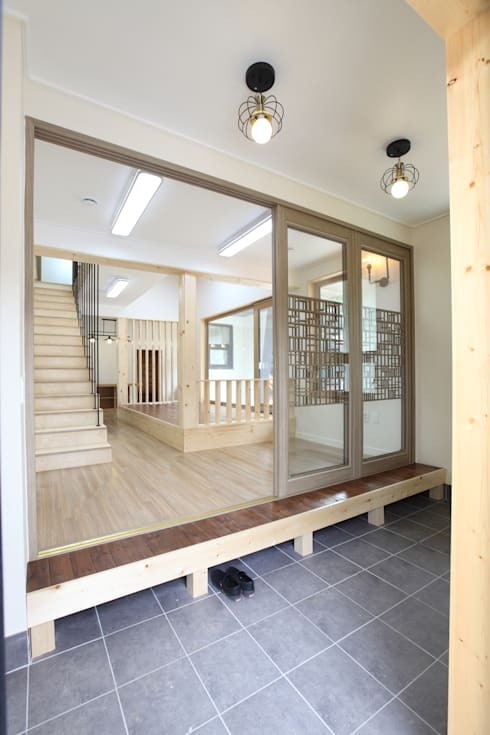 The composition of the corridor within the two floors, with a view of the attic on two sides makes this area very pleasant for families getting together. Now, let's dig deeper in to the floor area of the two. You need to pass through the attic where the main room for the father are located on the top floor and on the floor of 2.5, which includes the first floor. In the middle of it, there are half a floor construction which is also leading to the second-floor corridor. Because of the heights of the father's room and the second floor with the baby's room, the impression of three dimensions was abundant. 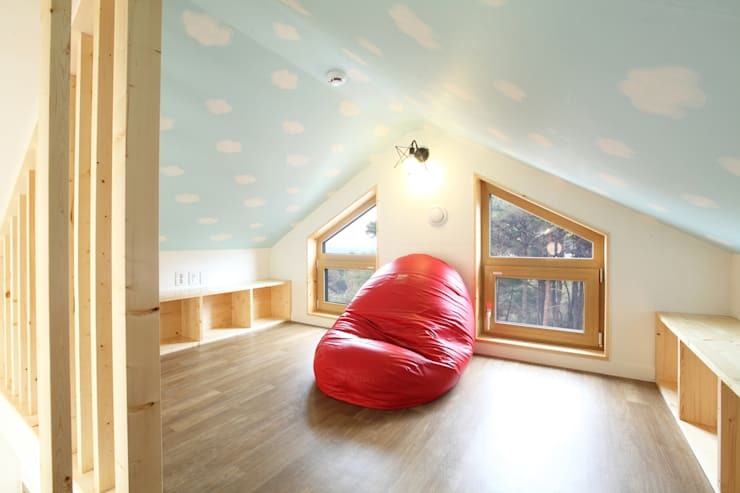 There is a natural feeling to it, plus the warmth from the wood material, and there are stairs that lead to the sides of the attic so that children can interact with his father. 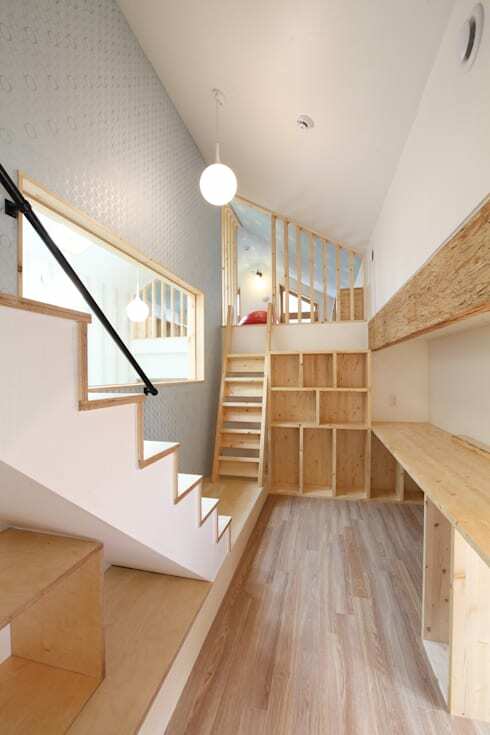 The last area in this house, which is full of exciting elements and can make anyone feel at home, is a loft area that became a children's playground. You can see the children's playground while climbing up the stairs on both sides of the floor. The room in the attic sparked the creativity of the children at the same time protect their integrity. The father can monitor his children seeing them by the room, as the attic will always be a haven where children love to play. Did you like this home? Let us know below!